It might seem strange that you could have an address for a relative, but not their name. It’s not as strange as you think. Addresses require a level of accuracy that names historically have not had. For example, I know that my gg-grandparents lived in New York under my gg-grandmother’s surname and not my gg-grandfather’s surname. That has caused no end to problems in tracking down evidence that they lived in New York at all during the years I know they lived there around the turn of the last century. The fact that they lived under my gg-gradmother’s surname indicates perhaps that there were other reasons not to list their real name. Perhaps they did not arrive legally in the country. I don’t know the answer to that question yet. I’ve tried without success to find reference to them in the censuses that happened while they lived in New York, but have never found them under either surname. 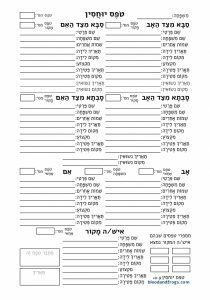 Searching by name on the commercial databases like Ancestry.com works very well these days, so if they were in the census records under either name I should be able to find them, yet I haven’t found them yet. It could be that they used even another name, that their name was transcribed incorrectly, or that they’re just not in the census records. 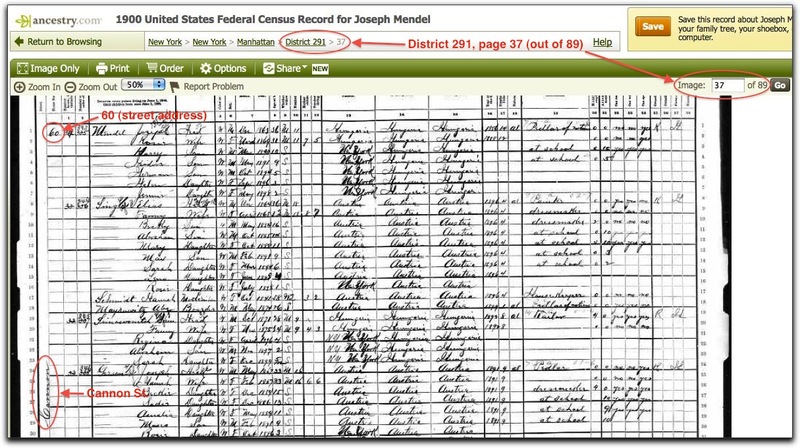 This brings up what used to be the way people searched census records, before they were indexed by name. 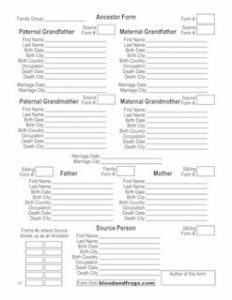 You would find where your ancestor lived, then based on the address figure out the enumeration district that address would be in, then go through all the pages of the census for that enumeration district until you found the address, and then look for your relatives. 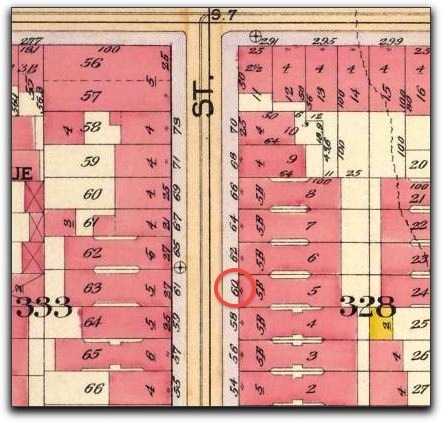 Recently I found a document that listed my gg-grandfather’s address in 1902 in New York. Now, of course he could have moved there just before listing that address, but it was sufficiently close to 1900 for me to look into that address during the 1900 US Federal Census. So how do you go about doing that? 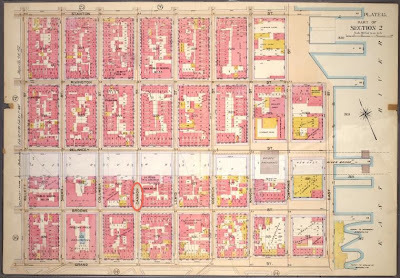 First, you need to figure out the enumeration district in 1900 for the address. In this case the address is 60 Cannon St. in Manhattan. 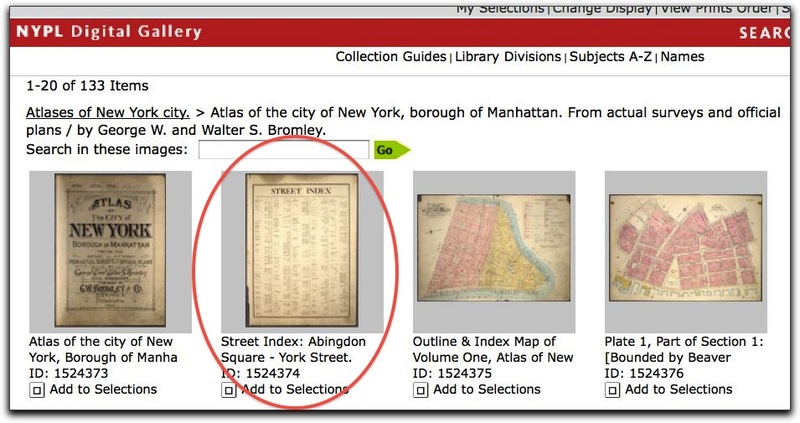 This address doesn’t even exist today, as the streets downtown in New York have changed, but you can get around that fact by looking at old maps of the city. 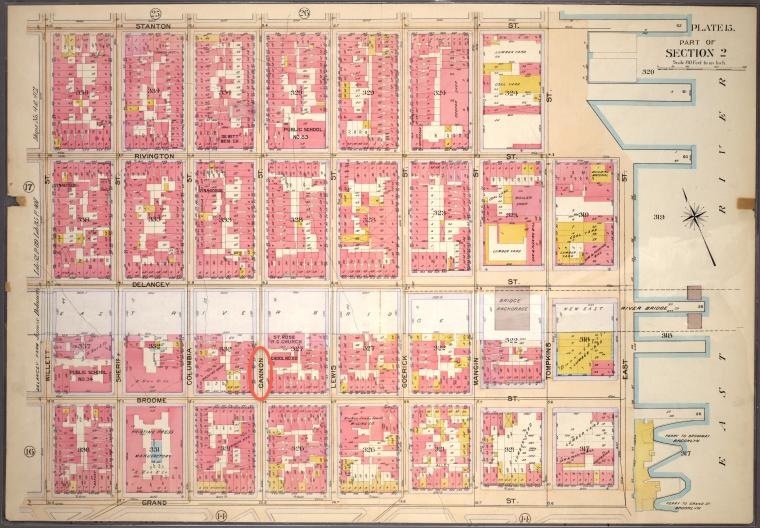 Page from 1899 NY street atlas showing Cannon St.
Now we know that the cross-streets are Rivington (above the block) and Delancey (below the block). Why is that important? Because the next step is to figure out the enumeration district, and those cross-streets will help. Now we go to SteveMorse.org, a veritable swiss-army knife of genealogy tools to go to the page titled 1900-1940 Census ED Finder. As you can see in the image, I’ve selected 1900 at the top, then New York for the state and Manhattan for the city. I’ve then added the three streets from the block. If I had just entered Cannon St., the list of districted would have been very long. By adding three streets it should come down to one or two districts. In this case as you can see it has determined two districts, 288 and 291. Why are there two districts for one block? The reason is easy to figure out – Cannon St. on that block must have been the border between two districts. In one district we should find odd number addresses, and in the other we should find even number addresses. 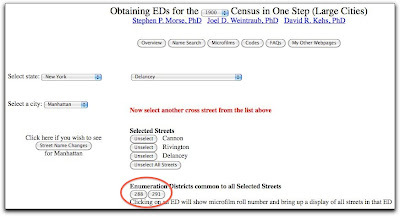 So where do we go to look for the census images for these districts? 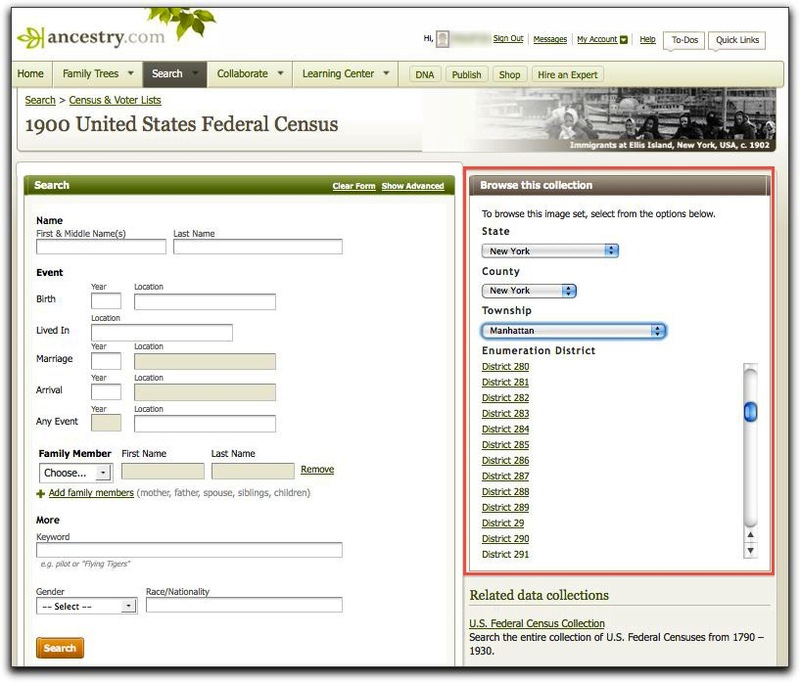 There are a few options, but I’m going to show how to do it on Ancestry.com which is what I use for census images. In the above image I’ve already chosen the 1900 census to search exclusively. 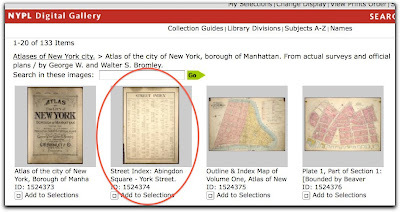 On the left side is the search interface that most people use, but on the right side (in the red box I’ve added) is a panel that allows you to browse by enumeration district. You can see I’ve selected New York for the state, New York for the County and Manhattan for the township. It then lists all of the enumeration districts, and I can select which one to view. 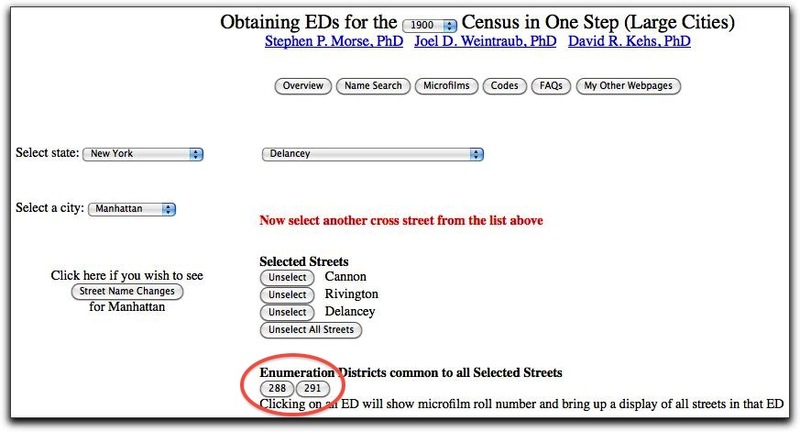 If you were to select enumeration district 288 first, and scan through the pages to find Cannon St., you would notice that all the addresses are odd numbers. That fits with my guess on the street being the border of an enumeration district. If you skip over to enumeration district 291, you will see that the numbers are all even. Oddly there are a few street numbers from Cannon St. at the beginning of the census file, then it jumps to another street, and then back to Cannon St. later. 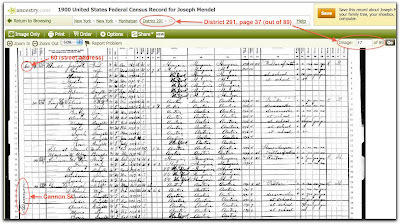 Up until now I’ve been showing you how to take an address and find the census records for that address. The second lesson I want to teach here at this point is to keep your records organized an to always refer to your notes before jumping into a research project like this. If I had done so I would have noticed that I have another document from 1901 (a Declaration of Intent to Naturalize) that lists a different address. In fact the 1903 Petition was also in an entirely different address, so three addresses in three years. I guess they moved around a lot. If I had not jumped into the research before looking at what other documents I had, I would have saved a lot of time. It still makes for a good example for this blog, however, so I hope it was helpful. 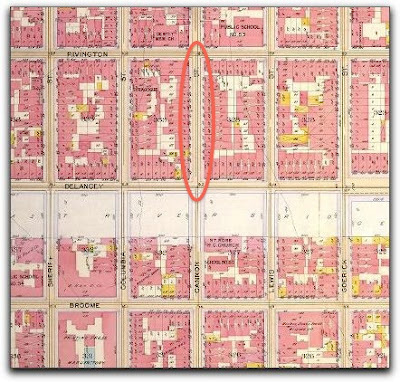 To end the post I should add that the address from 1901 was on the other side of the same block (i.e. 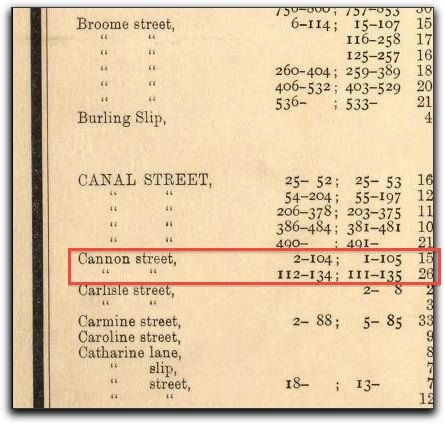 the next street over) on the same map page I found for Cannon St., and the address showed up in enumeration district 288, the same one that had the odd street numbers for Cannon St. (this address was even numbered) and unfortunately also came up empty. Considering they lived at different addresses in 1901, 1902 and 1903, I guess it’s not too surprising that they lived someplace else in 1900 as well. Thank you for an actual step by step explanation of this process.